We recently spent a week camping at Bronte Creek Provincial Park. It was our first time camping there, but not our first time to the park. Established in 1975, Bronte Creek Provincial Park is 1685.83 acres in size. Bronte Creek trickles east through the park, dividing the day-use and campground areas with a ravine that is 115 feet deep. This provides for some very awesome views, and lots of picture opportunities. Bronte Creek Provincial Park is unique, in that it has two separate entrances; one for the campground, and one for the day-use area. The campground is open from early April until late October, and the day-use area is open every day of the year except Christmas day. Looking for a close-to-the-city getaway? A place to kick up your feet, relax, and spend some quality family time soaking in some nature? 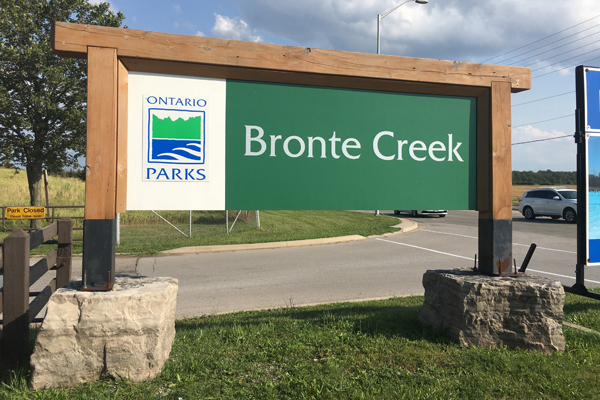 Bronte Creek Provincial Park may be your best solution in the GTA – specifically Oakville and Burlington. It’s close to the highway, which is super convenient if you are on a long trip. Close to Toronto and Niagara Falls, Bronte Creek has campsites for tents, small campers, and large trailers. Although Bronte Creek is large and somewhat secluded, you can see the tops of houses in a nearby subdivision, just north of the campground. Don’t worry… you won’t have unwanted site-to-site solicitors… unless you foolishly leave your food or garbage out. If you are new to camping, you can sign up for the awesome “Learn to Camp” sessions that are offered each weekend in the summer. Camping season at Bronte Creek runs from April to October. Reservations are accepted up to 5 months in advance of your arrival date. The campground is located north of the QEW, just west of Bronte Road and Upper Middle Road. There are 144 electric hookup campsites, with varying degrees of size and privacy. Water taps are located throughout the campground. If you are like us, and travel with a travel trailer, Bronte Creek can accommodate your RV, up to 32 feet. There are a few select sites that can accommodate larger RVs. There’s a filling and dumping station for RV and trailer campers. Each campsite has a power post, a picnic table, and a fire pit. There are large garbage and recycling bins located at the entrance to the camping loops. Please remember to properly dispose of your garbage and recycling, and help keep our beautiful parks clean. As well, proper disposal of your garbage and recycling will keep the critters away. Firewood can be purchased at the front gate store. When camping, lots of people like to bring their own wood. This is not only frowned upon, but against the rules at Ontario Provincial Parks. Tree-killing insects and diseases can lurk in or on firewood. New infestations of insects, such as the emerald ash borer, can destroy forests, and cost a lot of money to control. Even if the wood originated from your own property, best not to move it. Bronte Creek also offer Yurt camping. Yurts are a semi-permanent 16 foot diameter canvas-covered structure, mounted on a raised wooden deck. Yurts sleep up to 6 people. Inside, you will find a table, chairs, a broom and a dust pan. Outside, you will find a propane BBQ on the accessible deck, and a picnic table and fire ring on your site. You will need to bring your own bedding, cookware, dishes, food, and anything else you’ll require to enjoy your time away. Sorry… no pets allowed in yurts. Yurt fees are $97.18 per day. There are two playgrounds in the campground. One is located between the Prairie and Savannah loops near the comfort station, and the other is located between the Woodland and Ravine loops near the comfort station. Maiden’s Blush Trail: A wheelchair accessible 1km paved trail located in the day-use area, which is suitable for walking, roller blading and cycling. The trailhead is north of the Children’s Playbarn. Trillium Trail: A wheelchair and stroller friendly 1km trail, located in day-use area. The trailhead is located behind the barns of Spruce Lane Farm. This trail is the best place to see spring wildflowers. Remember, pictures only – no picking any of the flowers! Ravine Trail: This 2.7km path meanders along the top of the ravine in the day-use area. Halfmoon Valley Trail: At 2kms long, this trail is located in the day-use area. Trailhead is minutes from Spruce Lane Farmhouse. Gateway Trail: This trail is 1.5kms long, and is located in the Campground area. The day use area is across the ravine from the campground. That means you need to leave the campground, and drive 6kms to the day use entrance off of Burloak (north of the QEW). It’s a quick drive, but there can sometimes be traffic (especially during rush hour). South on Bronte to the QEW, west one concession to Burloak, then north to the day-use facility. Once at the day use area, you will find lots to do. There are walking trails, a play barn, a farm, the Nature Centre and Spruce Lane Farm. The Nature Centre is both fun and educational. It gives you an interactive experience into the flora and fauna at Bronte Creek. With live reptiles and insects, and other fun activities for both children and adults, the Nature Centre is a must visit! The play barn will provide kids 10 and under with hours of fun! Lauren had a lot of fun running around, and enjoyed the activities in the play barn. There is also a 1.8 acre pool, which is an additional cost (reduced rate for campers). There are change rooms, washrooms, and showers available, as well as Bronte Creek Provincial Park’s awesome PARKsmart PFD lending program. The pool is open July 1st to September 4th, weather permitting. The park store is located across from the pool. You’ll find souvenirs, camping supplies, pool items, food, and ice cream. Bronte Creek is well known for their festivals. There is so much to do at Bronte Creek’s annual Harvest Festival. The festival runs this year on the weekend of September 23rd and 24th, 2017, and there is lots to do for people of all ages! You can’t leave the Harvest Festival without enjoying a delicious apple blossom (or two)! As always, the tour guides will be dressed in clothes from the 1809s, typical of the Victorian time period. Everything is included in your daily park admission fee, except food and pony rides. It’s March. Freshly fallen snow. Cool breeze. Acres of tapped maple trees. The smell of boiling maple sugar in the air. Knowledgeable guides and interpreters, dressed in Victorian clothes. Tractor drawn wagon rides. Many families enjoying pancakes and sausages with fresh maple syrup. That’s Maple Syrup Festival at Bronte Creek. Starting the first Saturday in March (9:30am to 3:00pm every weekend, and the entire week of March Break), the Maple Syrup Festival at Bronte Creek are a must visit. Enjoy demonstrations on historical ways trees were tapped for maple sugar, and lean to make maple syrup. You can also enjoy maple taffy, and a pancake meal. Don’t forget to pick up a bottle of Bronte Creek Provincial Park’s own maple syrup, and a souvenir from the Maple Gift Shop! Budget about $40 per family for a pancake meal, and additional money for and souvenirs from the candy shanty, gift shop, and maple taffy station. Explore the paranormal side of Spruce Lane Farm. Visitors will be guided through the 1899 farm house, and taught about the strange customs Victorians had surrounding death. With so many unexplained happenings at the farmhouse, those who believe in ghosts will be fascinated. The tours are educational, and are not meant to frighten or scare. The tours are held on two Sundays each August, and reservations are not required. Call the park at 905-827-6911 ext. 231 for exact dates, or more information. We had lots of fun at Bronte Creek! Our family had a blast exploring, learning, relaxing, swimming, hiking, cycling, bonding, and camping at Bronte Creek. As Lauren put it, “it’s so close to home, so we can come here whenever we want!”. One may think that camping 10 minutes away from home is not really “going away”… until you do it, and realize you can have a lot of fun without having to go too far, and still have the convenience of a quick drive home if you forgot something. You can follow Bronte Creek Provincial Park on Facebook, Twitter, Instagram, Flikr and Pinterest. Disclaimer: I was offered 4 nights of camping at Bronte Creek Provincial Park for an unbiased review of the campground and the day-use facilities. All opinions are my own. Wow! It sounds like there are a ton of things to do there! That’s awesome that you live close to it, too! Lots to do, and close to home. Great for brining the girls friends for a fun day excursion, or if we want to “get away” without going too far. Ooh! I love that there’s a yurt option! We really want to try camping with our kids, but without investing in ALL the equipment. It is a great option for those without camping equipment, or if you don’t want to stay in a tent. I know a lot of people who would love camping more if they were not in a tent, especially when it rains. This would be a great option. No rolling up wet tents! OMG Craig! I had no idea they had so much that is accessible in the park at Bronte. I heard a few people I know that were going there this summer. Loved seeing all the photos. Also I actually didn’t know they do learn to camp classes which is very smart. I am placing this one on the list for next year actually. We just stayed in a yurt in the Wasaga Beach area. The yurt was a lot of fun That’s a great way to camp too. Love seeing that Bronte has them. The one thing I love about Bronte is that it is hidden within the city. You feel like you are so far away, yet you are so close to grocery stores, and in our case, home. The yurts are a fantastic option. Let me know when you do camp there… Wendy and I would love to see you! We are so glad to have hosted Craig and his family this August. Just what we wanted help with— connect with a new audience. Should any of the readers out there have any questions send them along. Remember that the park is open for camping until Oct 22 this year. The day-use activities (trails, playbarn etc.) are open year round. Follow us on social media @opbrontecreek let’s us help you plan a fantastic trip to the park. The Learn to Camp Program is super fun way to get back into camping or learn skill for the first time.